In some rare cases, a home with a high level of iron or manganese in the soil and/or groundwater will allow the growth of a microorganism known as iron bacteria. As this bacteria thrives in groundwater, it creates a thick, gelatinous substance known as iron ochre. While this is not known to be a health hazard, it can quickly clog a French drain system. It also emits a foul odor and leaves rust-colored stains on everything it contacts. Our WaterGuard® IOS (Iron Ochre System) Perimeter Drain Channel is ideal for managing this difficult problem. The wide-open design of the drain helps it resist clogs, while a removable lid allows for easy access and maintenance. your basement dry all the time! Don't let iron ochre clog your perimeter drain system and ruin your basement! To schedule a free iron ochre perimeter drain quote, contact us by phone or e-mail today! 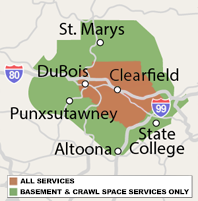 We proudly serve the Pennsylvania area, including Saint Marys, Bellefonte, Altoona, State College, Du Bois and many surrounding areas. Iron ochre is typically rust-colored, but can also be yellow, brown, or gray. This slimy material is a menace to typical perimeter drain systems and can clog them in a few months' time. What Is Iron Ochre & Iron Bacteria? Iron bacteria is a microorganism that lives by oxidizing minerals dissolved in water -- especially ferrous iron and sometimes manganese as well.As it does so, it creates a thick slime or ooze that's usually reddish-brown in coloration. This ooze will stain anything it contacts. It has a swampy, musty smell, and it makes drinking water taste terrible. These stains can also show up in laundry if the line contains iron-tainted water. Iron bacteria attaches itself to the inside of pipes, forming layers of iron ochre as it goes. Eventually, these layers result in the complete blockage of pipes -- and can even lead to deteriorating pipes, as iron bacteria uses the iron from the pipes as a food source. The sludge is not easily flushed out -- it must be manually scooped out. We Waterproof Basements With Iron Bacteria & Iron Ochre Problems! No matter how challenging your basement problem is, Bowman Masonry & Waterproofing has the solution you're looking for! Our iron ochre perimeter drain system is customized to handle any kind of iron bacteria issues that may arise -- and is the ONLY cleanable, flushable iron ochre system of its kind! To schedule a free basement waterproofing quote to solve this or any other wet basement problem, contact us today! We'll send a specialist to your home to inspect and measure the space, answer any questions you may have, and provide you with a customized cost quote. Our experts proudly serve the Pennsylvania area, including Saint Marys, Bellefonte, Altoona, State College, Du Bois, surrounding areas such as Pennsylvania Furnace, Brockway, Port Matilda, Tyrone, Ridgway, Kersey, and nearby towns in Pennsylvania.